I knew I wanted to share a recipe for Valentine's Day, but I had trouble figuring out which direction I wanted to go. I love chocolate + peanut butter combination so that became my basis. From there I wasn't sure if I wanted something fancy or simple. I decided on simple. I remembered this recipe because it is something we make at Christmas. It's absolutely the best to munch on and a great add on to your cookie exchanges. Valentine's Day is all about love and food is the way that I show the people around me that I love them. Instead of making one little fancy dessert, I decided to post something you can share with all the people you love whether that be coworkers, your family, or members of your church. Brighten someone's day next Friday by bringing these with you. 1. I usually start by breaking apart the German chocolate squares and giving them a rough chop so they don't take forever to melt. Measure out your dry roasted peanuts and have them ready by the stove. 2. In a large saucepan, over low-medium heat, add all of your chocolate. Stir regularly. 3. As it begins to melt, stir constantly until it reaches a smooth consistentcy. 4. Take off heat and stir in peanuts. 5. Once covered by the chocolate, spoon out onto wax paper. Sprinkle with sea salt if desired. 6. Let harden for 20-30 minutes. I usually store them in the fridge (or on my porch) until ready to serve so that they don't melt. Thats it! 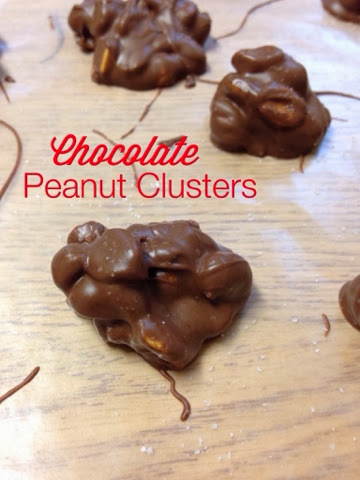 Super simple to make and with 3 types of chocolate it has to be good. Some people are thrown off by the amount of white chocolate. These don't taste white chocolate-y at all, it just makes the other chocolate taste creamier. Below is a video from Christmastime showing the process. Just keep stirring!